Since December 2012 I have been renting a large dedicated server for one of my websites. This server has 72TB of raw disk storage with a monthly fee of $799. The site gets 25 gigabytes of new content uploaded daily and by the beginning of 2016, the available disk space was down to less than 10TB. Faced with running out of space by the end of the year, I started looking for a new solution. One of the first ideas was renting a second 72TB server from the same company, which would have doubled my server hosting cost to $1600 a month. Looking at the numbers, paying that much a month was more than I had wanted to pay since at the current rate of uploads, I would only fill up 1000 gigabytes every 40 days, yet I would be paying $799 right at the start for 72TB. This means it would take almost 7 years to fill up the new server while paying over $67,000 in server rental fees just for the one new server. A few other ideas that I considered included renting multiple smaller, cheaper servers with several terabytes of storage each, looking into cloud hosting or a content delivery network, or colocating my own servers. Years before going with the current 72TB server, I had rented four smaller servers and found that the downside to this option was additional sysadmin work with four times the number of servers to keep up to date and increased probability of one server going down for one reason or another. One bonus with this option though was that if one server does go down, the site’s content will still be partially available from the other servers. Cloud hosting and a CDN was ruled out due to needing an average of 300+ mbps of bandwidth in addition to the large storage requirements. After considering all the possible options, only one option stood out above the rest: colocation. Colocation is where instead of renting a server in a datacenter, you are renting rack space, bandwidth, and power. Everything else hardware-wise is provided and managed by you. With colocation, there are higher upfront costs for initially buying the hardware, but over the long term, it will usually be more cost effective. Usually the more specialized the hardware, the faster you will be able to recoup the costs. It doesn’t really pay off to colocate basic servers that can be rented for less than $100 a month unless you are renting many of them. However, if you are in my shoes and need dozens of terabytes of storage and lots of bandwidth, colocation might be a good choice. Another plus of going with colocation is that to help ease the cost of purchasing the server hardware, you are also able to depreciate the expenses on your taxes over five years. Some people say that renting a dedicated server is a better choice for them because it lets them easily upgrade to newer hardware regularly with less upfront costs. While this is true, I’ve found in my situation, I usually rent servers for years at a time. I use the FreeBSD operating system, and unlike Windows, it does not slow down over time with new updates. The multi-core CPUs of today also provide plenty of power for basic web and database hosting. In over a decade of renting dedicated servers, I’ve had many hardware failures. The most common ones are hard drives and then power supplies and fans. Motherboards, CPUs, and memory are usually less likely to fail but it still happens. I’ve even had a hard drive cable fail once. When you are renting a dedicated server, your provider is responsible for keeping replacement parts available. When colocating, you are the one responsible for the parts and if you are unable to be at the colocation facility to replace them yourself, you will have to pay for someone to do it. If a colocated server has a hardware failure, the site could be down for a significant amount of time while a spare part was rushed to the datacenter. My solution for this situation was to have an entire second identical server as a cold spare. This lets me swap in anything that may fail in the primary server and if I am unable to determine the problem with the primary server, I can move the hard drives to the spare server and have the site back up and running in minutes. When choosing to colocate your servers, you have two options: a local or a remote datacenter. Reasons why someone might choose to go with a remote datacenter might be lower prices, better connectivity, or placing the servers closer to their users for faster access and lower ping times. Thanks to out-of-band management devices such as IPMI, and KVM over IP, along with remote technical support, colocating a server in another state or even another country isn’t really a big deal. In my case, I went with a local datacenter since I am located in a major metropolitan area. I am a 30 minute drive away from the datacenter, which lets me stop by any time if there is a problem with the servers. This lets me save on remote hands fees. I also do not need to worry about shipping servers that weigh over 100+ lbs to another state and them possibly getting damaged. There is also a major airport in the city so I am able to fly into town to perform any needed maintenance should I decide to live elsewhere in the future. 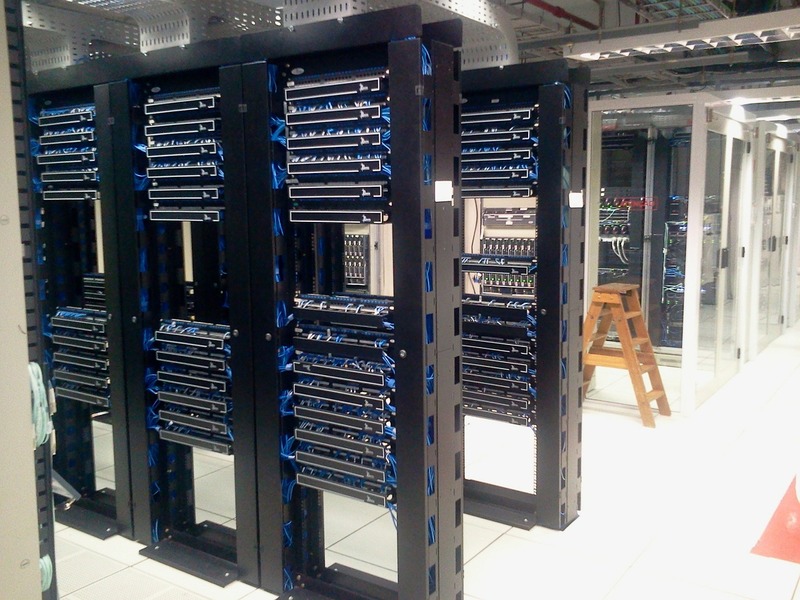 If you are looking into colocation, you should email your provider about any items you might need for your rack. For mine, I had to provide my own network switches, PDUs, patch cables, and power cords. Other things you might need are cage nuts, and zip or velcro ties to keep cabling tidy. Usually datacenters will have crash carts with a monitor, keyboard, and mouse available for customers to use. Another thing to consider is using labels to label everything since there is a possibility you might have datacenter staff perform simple tasks on your equipment instead of you personally making a trip to the datacenter in the middle of the night. Label everything you can think of, from servers, network ports, switches, to hard drive bays. • What is the cost of remote hands. Is it billed by the minute, a block of minutes, and is there a minimum number of minutes charged. Overall, I’ve had a great experience renting dedicated servers. I have more privacy and security when I am not sharing a server with hundreds of other users. I only have to worry about my own sites and scripts running on the server and not a badly programmed script from another user running amok and overloading the server. Even now when I have my own servers at a colocation facility, I still have four servers that I am renting, mostly because the servers average less than $100 a month each and I do not have to worry about hardware replacement when something fails. In part 2 of switching to colocation, I will go into detail of the hardware and costs compared to what I was paying to rent a server.